Lesson list for a comprehensive series of studies in Hebrews, with special attention to the high priesthood of Christ. Tap any title next to an arrow in the list below. ➤ Topical Outline of Hebrews —This outline collects together portions of the book of Hebrews under ten topics, and is linked to the study pages as an index. ➤ Expository Outline of Hebrews —This outline of the epistle to the Hebrews follows the Hebrew writer's thoughts in the exact order that he presents them. ➤ Old and New Priesthood Chart —Sets out four elements of concern to the Hebrew writer: the law, the priesthood, the throne, and the oath. 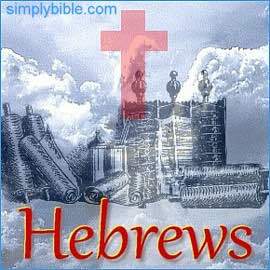 ➤ Key Verses in Hebrews —to introduce and commend the letter, and its main idea: the authority exercised by Jesus as our great High Priest. ➤ Nine Beliefs About Jesus —The Hebrew writer’s own introduction, telling us of the authority of Jesus our great High Priest. ➤ Throne, Scepter, and Anointing —A lesson on Hebrews 1:8-9 about the throne, scepter, and anointing of our Lord Jesus Christ the Son of God. ➤ Jesus Crowned With Glory —In this lesson, we think about the Hebrew writer's statement that Jesus Christ is "crowned with glory and honor" (Hebrews 2:9, Psalms 8:5-6). ➤ A Rest for God's People —After God created the world, he rested, indicating that beyond our life in this world we can look forward to a rest with God in heaven. ➤ God’s Three Oaths —The promise that beyond our life in this world we can look forward to a rest with God in heaven, is made sure by three different oaths sworn by God. ➤ Pressing On to Perfection —On four occasions in the course of his letter, the writer to the Hebrews interrupts his teaching about Christ to exhort his hearers to grow up and get strong. He warns them about their lack of diligence and their potential to backslide. ➤ Jesus a Priest Like Melchizedek —The Hebrew writer discusses the credentials of Jesus Christ based upon a Messianic prophecy sworn as an oath by God, "You are a priest forever according to the order of Melchizedek". ➤ The Perfect Priest —Continuing the previous lesson about the credentials of Jesus as High Priest. ➤ Jesus the Intercessor —We are greatly blessed in having a great High Priest, one who ever lives to make intercession for us. ➤ The Intercessor’s Credentials —We look at seven things that qualify Jesus to intercede with God on our behalf. ➤ Jesus the Mediator —Explaining the meaning of Christ’s mediation of a new covenant. ➤ The Better Covenant —About the powerful new law or covenant that Jesus mediated to mankind. Even the very promise of it long ago rendered the law (under which the old priesthood functioned) obsolete and ready to disappear. ➤ Jesus the Perfect Sacrifice —The body and blood of Jesus, because he was without sin, made an offering that satisfied God once and for all. ➤ Jesus the Author and Perfecter of Our Faith —Jesus is an author who finishes his work. His work is our faith enduring through many trials until finally glory comes and we live happily ever after. Every day Jesus is helping this story to be finished, and we should consider how he is doing this. ➤ Disciplined by God —Jesus helps us to endure chastening, to understand it and profit from it as we live in godly fear. ➤ A Great Cloud of Witnesses —The Hebrew writer helps us to focus on the quality of the faith authored and perfected by Christ. We are simply reminded of several inspiring examples of Godly men and women in Old Testament times who believed in Christ and sought eternal life. ➤ The Faith of Abraham —A continuation of the previous lesson looking especially at the faith of Abraham and his family. ➤ Giving Thanks to Jesus —At the end of Hebrews, we are reminded of some of the Christian duties that those who respond to divine grace will always remember in order to show gratitude toward God. ➤ His Grace is Our Strength —A continuation of the previous lesson. In keeping Christ’s commandments faithfully, we will live a Christ-centered life and realise the benediction, "Grace be with you all, Amen. ➤ Pressing on to Perfection (1988) —A lesson I presented at a lectureship in 1988. The title is the same as another lesson in this series on Hebrews, however on this occasion I treated the subject differently. ➤ Lettuces (Hebrews 10:21-25) —Digging around in some old sermon outlines, I found this lesson from Hebrews chapter ten. It’s called "lettuces" because the Hebrew writer makes three statements beginning with the words "Let us..."